Shop here for Neutral Baby Bedding, Baby Boy Crib Bedding & Baby Girl Crib Bedding! Narrow your choices down by shopping our crib bedding by gender! The perfect baby bedding can become the focal point of your baby's nursery. Choose simple, modern or classic designs from our assortment of baby bedding. From classic to modern, rest assured we have the perfect baby girl crib bedding, baby boy crib bedding and neutral baby bedding for your new baby! Can't find exactly what you are looking for in bedding for your child's room or nursery? 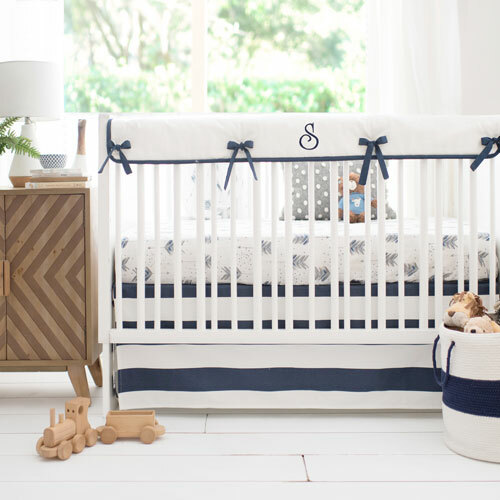 Design your own crib bedding through our Custom Baby Bedding Program! Our designer baby crib bedding is irresistible! Choose from over 200 fabrics and an array of styles of Custom Crib Sets, Skirts, Pillows, Curtains, Duvets and much more.